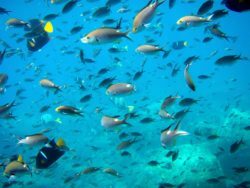 Aquatic wildlife and its wide range of marine ecosystems are becoming increasingly impacted by mankind. Most human beings tend to forget that the Earth does not belong to mankind, but rather the other way around! Thus we are inevitably closely linked to our nature. Why then impact and destroy the oceans? About 8 million tons of plastic enters the ocean each year. At least 5.25 trillion pieces of plastic are currently in the oceans, a third of which is concentrated in the famous Great Pacific Garbage Patch. At least one million seabirds and one-hundred thousand marine mammals die each year due to plastic pollution. It had always been assumed that cleaning the oceans was impossible, due to the vastness of the areas in which plastic is concentrated. To collect the plastic using nets and vessels from one garbage patch would take about 79.000 years and billions of dollars. There are many species of whales that are in danger of being extinct. Most baleen whales (the huge whales targeted by commercial whalers) are listed as endangered or protected species. Whales are, with their large seize, an easy target for the cruel hunting and killing. Today at least 7 out of 13 species are now classified as endangered! It is very worrying and dangerous for the marine environment as whales have an important role being at the top of the food chain. The study attempts to tally the number of whales that were killed as whaling transformed in the late 19th and early 20th centuries from an enterprise carried out by men with rowboats to an industrialized effort capable of processing the sea mammals at a previously unimagined pace. The hunt expanded rapidly, with international calls as early as the 1920s to bring in restrictions as the industry threatened to bring about its own demise through overhunting. Whale watching is a huge business and contributes billions of dollars to the country’s economy. Every year millions of people spend money to watch these majestic creatures in their own environment and leap into the air. This spending has led to increased economic growth and stimulation in both developing and wealthy countries. Continued whaling will make whales a lot rarer and harder to spot. This would be devastating for the whale watching companies and therefore the economy. Whaling is against many people’s ethics and is disapproved of by many. It also ruins the ecosystems which become damaged through the increased carbon in the air contributing to global warming and other atmospheric problems. Fish will disappear which means less food for us and other mammals. The Ocean consists of so much co-dependent life with many species all relying on each other in order for the food chains to run smoothly and co-exists healthily. If any of the creatures get taken out of the system the whole chain will fall apart. Whales, the largest mammal of the seas, play a major role in this community- what they eat, how their body is used at death, their excrement etc. and they are all vital to the oceans. The flora and fauna are part of the ecosystem so when that is affected, so is the flora/fauna. Changes in the atmosphere will affect all plant and animal life and changes in the environment and the food system caused by a reduction in the number of whales will cause the flora and fauna to be out of balance.